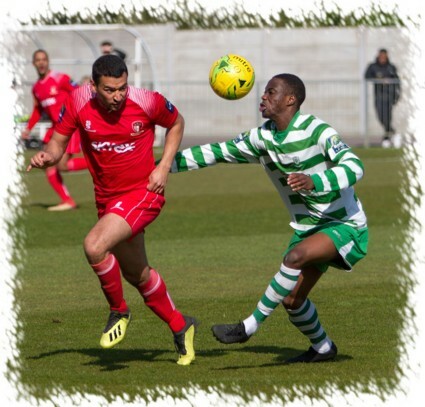 Despite a much changed starting line-up, Hayes & Yeading's divisional champions added four more goals and a further three points to this season's already impressive numbers. United knew this was not going to be an easy game, Waltham Abbey being one of only two teams to take three points off United this season courtesy of a controversial 1-0 win at Cappershotts before Christmas. 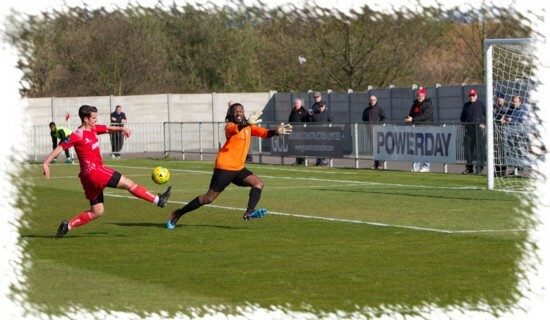 This one took ten minutes for an opening to be created and this fell to United as Chid Onokwai played the ball on to Lee Barney, United's top scorer being denied by the legs of Abbey 'keeper Anthony Page. Within a minute United were ahead though when Nathan Webb played a fine ball to Onokwai in the left channel, the big striker showing good feet to dance past his marker and along the bye-line before smashing the ball past Page at the near post from a tight angle (above). The twentieth minute saw the woodwork deny United another. Barney collected the ball on the right side and raced forwards before firing a low centre that reached Toby Little beyond the far post, his shot from an angle going wide off the upright. United pushed forwards still looking for a second. Tom Jelley, in his first start since returning from injury, collected the ball in the middle of the park and run through the middle of the Abbey defence only to be denied by Page's outstretched leg and two minutes later he was on the charge again, this time feeding the ball to Barney who saw his shot pushed away by Page. It was just beyond the thirty minute mark when the visitors finally put pressure on the United goal. A whipped in cross from the left was headed goalwards forcing a sharp diving save from Jack Smith, the United stopper quickly recovering to deny Louis Bowen form close range on the follow-up. Five minutes from the break the ball was on the penalty spot, United's Mitchal Gough being penalised for a trip inside the box. Nathan Koranteng stepped up only to be denied by Smith who guessed correctly and held onto the spot kick. Minutes later a Smith made an even better save, Jack Stevenson played a free-kick to the far post, this was met with a powerful header from Abbey skipper Billy Holland, the United 'keeper pushing the effort onto the crossbar before the danger was cleared. United could have ended the half on a high as a lofted pass found Barney who shot tamely at Page and the Champions went in a goal to the good at half-time. 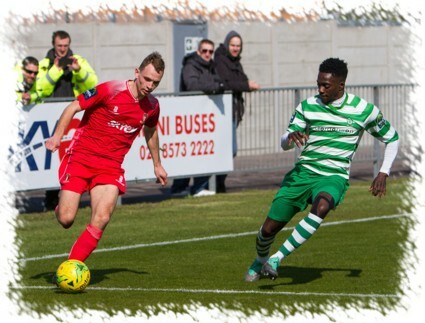 The first chance of the second half fell to the visitors when Scott Bridges was dispossessed in his own half by Timothy Ogunrinde who proceeded to smash the ball high over the United goal. Page was soon in action at the other end tipping a Bridges free-kick around the post and a few minutes after this Nathan Webb sprayed the ball out to Onokwai on the left, his ball to the near post saw both Little and Barney converge on the ball only to be denied by an excellent block tackle from Germaine Dua. On the hour the United defence had to be alert as Stevenson fed the ball to Ellis Brown in the United box, his shot being deflected wide by a well timed challenge and just a minute later a ball over the United defence to Ogunrinde was intercepted by Smith who was out quickly to meet him, the ball was swiftly cleared to the other end whereby the ball came in from the left to Barney who muffed his shot and the danger was cleared by the visitors defence. On 67 minutes a miss-kick by Connor Toomey just outside his own box saw Stevenson hit a first time shot that curled perfectly beyond Smith's dive into the far corner to bring his side level. Fired up by conceding, it took United just seven minutes to open up a two goal advantage courtesy of substitute Elliot Benyon returning from injury. His first on 72 minutes came courtesy of a pinpoint centre from Little, Benyon heading past the unprotected Page from six yards out. Two minutes later Benyon had another, the time latching onto a lofted pass from halfway by Little that dropped beyond the centre of the Abbey defence, the United striker coolly slotting the ball past Page into the vacant net (above left). Still United wanted more. Benyon played the ball inside to Little whose effort was tipped wide by the diving Page but number four was not long in coming as with nine minutes remaining all three United substitutes combined. 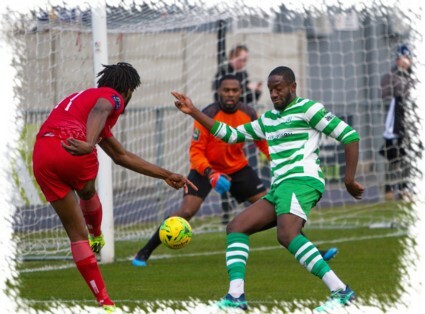 Kunle Otudeko played the ball to Chamberlain, his neat back-heel sent Benyon through, he scrambled the ball away from Page and Dua's attempts to block before unselfishly poking the ball to Chamberlain who tapped home from close range. The visitors were however to have the final say as a cross from the right side was bundled home from close range by Brown leaving United with a 4-2 victory meaning Paul Hughes' side have now secured 51 of the 54 points available thus far at the SKYex this season with just the final home game on Easter Monday to come, why not come along and see United collect the Bostik South Central division championship trophy and hopefully 3 more points. 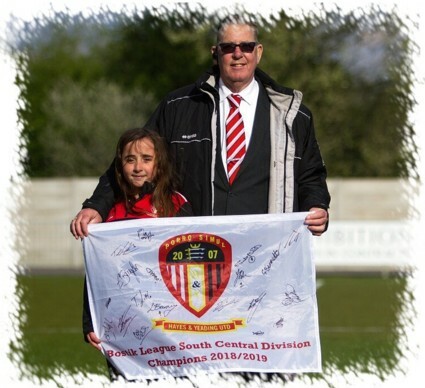 Above right, General Manager Derrick Matthews is presented with a signed Champions banner by helper Holly as a thank you from the players and supporters for all the hard work he has put in at the SKYex again this season including fooling the media into thinking that our carpet like grass pitch is 3G in recent days !!. United Man of the Match: Jack Smith.